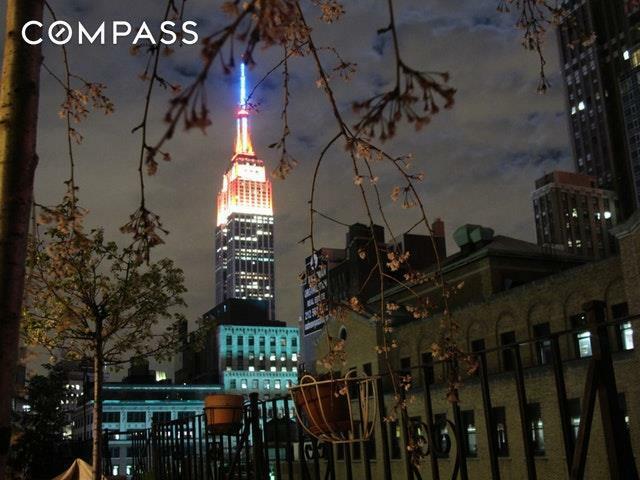 Empire State Building At Your Finger TipsStep outside to your terrace and see Hudson Yards nearby. 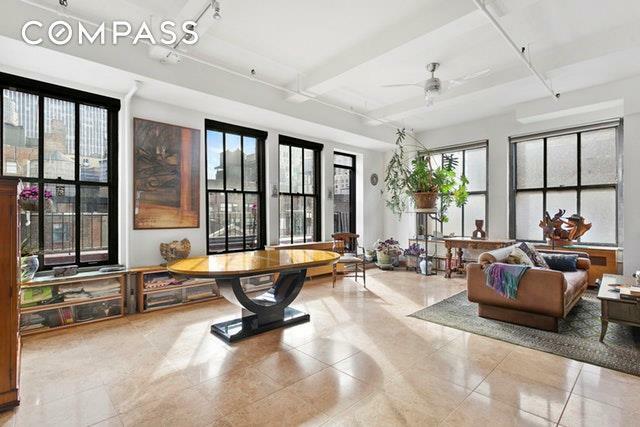 This extraordinary 2950 gross sf + south terrace FULL FLOOR residential loft (with 2 elevators and a freight) is delightful. 16 huge factory size windows stream tremendous light all day from four exposures. 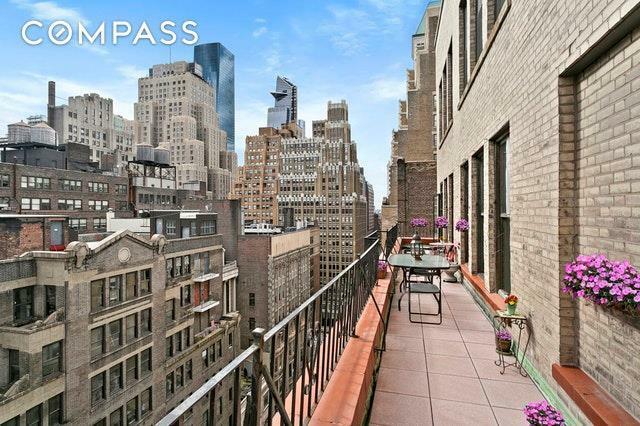 This is a midtown Oasis. Currently configured with a 25x24 great room for living, walls for an art collection, room for an office or library, with a windowed kitchen and 2 full baths in the main loft. The master bedroom has sweeping north views and glorious night sky (it is also possible to open two existing west windows). Second bedroom with western window is ideal for guests. There is a spacious and private laundry room on the floor. *OF SPECIAL NOTE: There is a separate legal rental unit for income, or for your guests, that has its own living room, bedroom, kitchen, bathroom, and balcony. It can be incorporated back into the main loft for a full private floor.The building is friendly to renovation. Converted from a button factory to full floor residential lofts, the building has been a coop since 1979. It was built in 1928 by Schwartz & Gross in the Art Deco style. 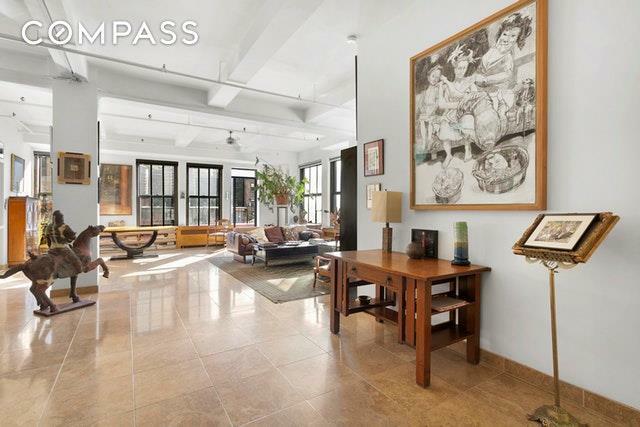 There is a restored marble lobby and separate entrance for deliveries with parcel receptacles and bicycle storage.This loft in the newly emerging Hudson Yards-Garment Center is conveniently near extensive public transportation A, C, 1, 2, 3, R, Q, N, LIRR and PATH trains. The Lincoln Tunnel provides easy access to New Jersey. The Hudson Yards complex, Times Square, Herald Square, Javits Convention Center, and the Broadway theater district are all close by.The Hudson Yards Redevelopment Project will include 14 ACRES OF PUBLIC OPEN SPACE. Much talked about, there is a performance/ART space The Shed, opening April 5th, 2019. An Equinox Hotel, high-end shops - including Neiman Marcus, Carrier, and Tiffany's, and restaurants featuring renowned chefs the likes of Jose Andres, David Chang, and Thomas Keller. Corporate headquarters will include Coach, L'Oreal, Milbank, KKR, HBO, and more to come. The Garment Center (with its recent zoning change) will be the focus of attention and investment for many years to come.